Union members and other federal employees rally to call for an end to the partial government shutdown, Jan. 10 at AFL-CIO Headquarters in Washington. WASHINGTON—On the 20th day of the federal government shutdown, an estimated 3,000 labor union officials, rank-and-file members and federal contractors clogged the street, crowding in front of the AFL-CIO headquarters on 16th Street, NW, demanding that President Donald Trump and Senate Majority Leader Mitch McConnell end the shutdown. Many of the protestors carried placards, handwritten signs, flags and other protest paraphernalia, all bundled up against the blustery, raw and frigid 36-degree weather. Cheryl Brewer, president of NTEU Chapter 71, took a bus ride to Washington, D.C., along with several hundred union colleagues from Philadelphia. She came, she said, to add her voice to and express her deepening concern about partisan political wrangling that has upended the lives of her and approximately 800,000 other federal employees. These workers are collateral damage, pawns, they said, of an attempt by Mr. Trump to exact $5.7 billion from Democrats to build a wall on America’s southern border. The wall, he contends, despite evidence to the contrary, will keep out tens of thousands of Central and Latin American migrants from entering the country. He has threatened to declare a national security crisis although none exists. He is using lies about the criminality of brown-skinned immigrants to bolster his case even though the reality is that immigrants commit fewer crimes than natural-born Americans. And he’s promising to keep the federal government closed until Democrats accede to his demands. The shutdown began on Dec. 22 and on Jan. 12 it became the longest in U.S. history. But for the shutdown, Ms. Brewer said, she’d be receiving a paycheck on Friday, Jan. 12. But with no end in sight to the impasse, she has no idea when the stoppage will end and money will start flowing into her bank account again. Until then, she and many others are scrambling to figure out how to adapt, adjust and hold things down. “It’s affecting me overall,” said Ms. Brewer, who has been a federal government employee for 33 years and who’s serving her third term as chapter president. “I have three daughters, two adults. They all live with me. One works for the Transportation Safety Administration. She has to report to work but she’s not getting paid. The middle daughter, who’s 21, is an independent contractor working with government employees and she’s not getting paid either. I have a mortgage payment, car payment, and utilities. Ms. Brewer said she’s less stressed than she could be because she has always bought food and other necessities in bulk from Costco. At the moment, she said, she has two refrigerators loaded with food and a cache of non-food items that will sustain her and her family for a while. The National Treasury Employees Union represents 150,000 employees at 33 federal agencies and departments. Michele Kennedy-Kouadio described the hardships the shutdown is causing her and her family. Currently, 420,000 federal employees are working without pay and an additional 380,000 of them are on furlough and are not being paid. Meanwhile, thousands of contractors who work for the federal government are not full-time employees, are not being paid and may never receive back pay. There’s fear, uncertainty and frustration simmering. Several of those at the rally explained that their ranks include single mothers, spouses who both work for the federal government, contractors who do not work with many of the protections and guarantees that federal employees do, like health benefits and pensions, and many of those affected by the shutdown are caring for family and other loved ones. Mr. Trump abruptly ended a Jan. 9 meeting with congressional leaders, getting up and walking out 20 minutes in after House Speaker Nancy Pelosi rejected his demand for the wall. He questioned why there was even a meeting and called the talks a waste of time. “Again we saw a temper tantrum because he didn’t get his way and he just walked out of the meeting,” Sen. Minority Leader Chuck Schumer (D-N.Y.) told reporters afterwards. The next day, eight House Republicans joined Democrats in approving a spending bill that would reopen the Treasury Department while funding the IRS as tax season gets underway, but Sen. McConnell refused to schedule a vote on a companion bill, calling it a “political stunt.” He said he will not advance any bill unless Mr. Trump agrees to sign it. 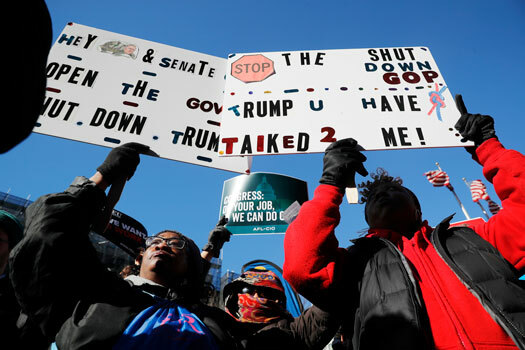 At the rally, a succession of speakers vigorously assailed Mr. Trump and Senator McConnell, saying the men needed to disengage the shutdown and the wall and deal with each separately. “No!! !” the crowd shouted back. The crowd heard from Sens. Bernie Sanders, Chris Van Hollen, Steny Hoyer, Mazie Hironi and labor leaders including NTEU National President Tony Reardon; American Federation of Teachers President Randi Weingarten; AFSCME President Lee Saunders and federal employees from NASA, the National Weather Service; air traffic control; the Department of Housing and Urban Development; Eric O. Young, national president of the American Federation of Government Employees’ Council of Prison Locals; and other workers who shared how they’re being affected by the shutdown. There are direct and indirect effects rippling across the country as a result of the shutdown. —Workers at the Transportation Security Administration have been calling off sick because they’re forced to work without pay. Many have or are considering taking temporary jobs to pay their bills. —The Food and Drug Administration administrator said the agency has stopped all routine food inspections, including some inspections of food, including fruit, meat, seafood and vegetables. —More than 13,000 employees at the Environmental Protection Agency have been furloughed, forcing the agency to halt work on activities, including monitoring the nation’s air and water quality, pursuing toxic polluters and regulating businesses. —About 5,000 Secret Service agents are working without pay and officials there warn that this situation constitutes a national security emergency. —Analysis by Bloomberg Government finds that federal contractors could be losing a combined $200 million daily. —The National Zoo and all 19 of the Smithsonian's museums in Washington and its environs have been closed. —The federal government owes the D.C. city government $5 million for its water bill. —Thousands of low-income renters who live in housing subsidized by the government could be evicted. A HUD employee who traveled from California told the crowd that a number of people depending on HUD assistance are in jeopardy. Veteran IRS employee and NTEU Chapter 22 President Horatio Fenton made the bus trip to the District of Columbia from his home in southern New Jersey. He said he didn’t organize the rally but has been actively supporting members, attempting to boost morale and trying to devise ways to help them through this impending financial crisis. “We came to D.C. to make a statement and have the president understand how many people’s lives have been disrupted,” he told The Final Call. “I’m not sure that it will register because he’s so focused on fulfilling this campaign promise and appealing to people in his base. He’s affecting people’s lives because they don’t know where the next paycheck is coming from. Luckily for him, Mr. Fenton said, his wife works a job that’s unaffected by the shutdown so that has helped lessen the stress he might have had if both of them were federal employees. He said it feels a little strange to not get a paycheck to take care of a mortgage, utilities and other financial demands. He thinks he is going to file for unemployment. The rally was one of two coordinated in D.C. by organized labor and there were similar rallies and demonstrations around the country.